The CCD family is welcoming new commercial, residential and industrial customers. Cocolamus Creek Disposal Service is the only family owned and locally operated waste management company in Juniata County. Headquartered in McAlisterville, PA, we serve approximately 12,000 residential, commercial and industrial customers in Juniata, Mifflin, Snyder, Union, and Perry counties. CCD has two conveniently located recycling centers. One at our McAlisterville location and one located in Mifflintown on William Penn Highway, Old Route 22/322. We buy metal at the McAlisterville location only. Effective October 1, 2009 there will be a charge for all recycling. 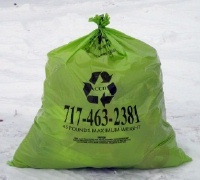 The cost is $5.00 per vehicle or $2.75/each for recycling buy a bags. Only recycling buy a bags may be dropped off after hours. For more information visit or call our office. 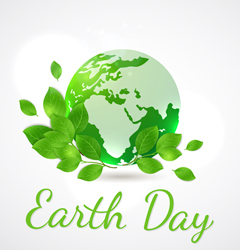 Did you know that April is Earth Month? Each year, we have a special Earth Day celebration at our McAlisterville location. Come join us as we celebrate this spring tradition at CCD. Now even our recycle bags have gone "green"!